Polls: Obama stays ahead in Ohio, deadlocked with Romney in Fla.
President Barack Obama gives a thumbs up as he participates in a campaign rally in Lima, Ohio, Nov. 2, 2012. Three days until Election Day, President Barack Obama maintains his lead in the key battleground state of Ohio and is locked in a close contest with Republican presidential nominee Mitt Romney in Florida, according to new NBC News/Wall Street Journal/Marist polls. In Ohio, Obama holds a six-point advantage over Romney among likely voters, 51 percent to 45 percent, which is unchanged from last month’s poll in the Buckeye State. And in Florida, the president gets support from 49 percent of likely voters, while his GOP challenger gets 47 percent. Those numbers are virtually identical to the ones from October, when it was Obama 48 percent, Romney 47 percent. Both states are two of the biggest prizes in Tuesday’s presidential contest. An Obama victory in Ohio, which awards 18 electoral votes, would put him tantalizingly close to getting to the 270 electoral votes needed to win a second term. President Barack Obama campaigns in Lima, Ohio as he rallies supporters in key states just before the election. But an Obama loss in the Buckeye State – and a Romney win – would place a hole in the president’s Midwest firewall. Meanwhile, Florida, which awards 29 electoral votes, is a must-win state for Romney. A Republican loss there would push Obama past 270 electoral votes – even if the president lost every other battleground state in NBC’s current map. As with the recent NBC/WSJ/Marist polls of Iowa and Wisconsin, Obama is benefitting from early voters in Ohio and Florida. In the Sunshine State, 63 percent say they have already voted or plan to do so before Election Day, and Obama is winning them, 53 percent to 46 percent. But Romney is ahead among Election Day voters in Florida, 52 percent to 40 percent. In Ohio, 35 percent say they have already voted or plan to do so, and Obama is leading them, 62 percent to 36 percent. Yet Romney is up among Election Day voters in the Buckeye State, 52 percent to 42 percent. The polls were conducted after Hurricane Sandy slammed into the East Coast, and seven in 10 likely voters in Florida and Ohio approve of the president’s job in handling the hurricane and its aftermath. “The response was overwhelmingly positive, and that was occurring across party lines,” says Lee Miringoff, director of the Marist College Institute for Public Opinion. 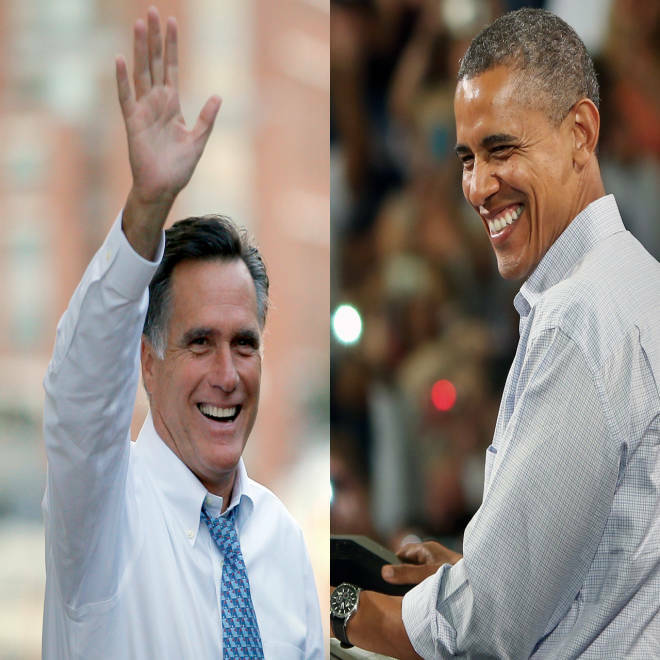 Meanwhile, Romney has a slight advantage over Obama in Florida when it comes to which candidate would better handle the economy – 48 percent pick Romney and 46 percent back Obama. GOP candidate Mitt Romney speaks to supporters in Chester, Ohio as he campaigns in key swing states ahead of the election. But those numbers are reversed in Ohio, where 48 percent believe Obama would better handle the economy and 46 percent side with Romney. Obama’s job-approval rating among likely voters stands at 48 percent in Florida and 50 percent in Ohio. In Ohio’s Senate contest, Democratic Sen. Sherrod Brown leads Republican Josh Mandel by five points among likely voters, 50 percent to 45 percent. And in Florida’s Senate contest, Democratic Sen. Bill Nelson leads Republican Connie Mack by nine, 52 percent to 43 percent. The NBC/WSJ/Marist poll of Florida was conducted Oct. 30-Nov. 1 of 1,545 likely voters, and it has a margin of error of plus-minus 2.5 percentage points. And the survey of Ohio was conducted Oct. 31-Nov.1 of 971 likely voters, and it has a margin of error of plus-minus 3.1 percentage points.